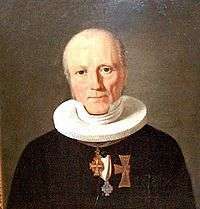 Jacob Peter Mynster (8 November 1775 – 30 January 1854) was a Danish theologian and Bishop of Zealand, Denmark from 1834 until his death. His father Christian Gudzon Peter Mynster who was a Chamber Councillor (kammerråd) and inspector at Frederiks Hospital, died in 1777. His mother, Frederica Christiane Nicoline (née Ring) died in 1779. Mynster and his three years older brother Ole Hieronymus Mynster were then brought up by a stepfather. Mynster received his theology candidate in 1794. He was tutor to the Adam Wilhelm Moltke. Between 1811 and 1828 he was a chaplain at Our Lady Church (Vor Frue Kirke) in Copenhagen. He was a lecturer in psychology at the Theological Seminary, in 1812 and later co-director. In 1814 he elaborated the basis for the version of Luther's Small Catechism, which authorization was for use in schools. The same year he helped to create the Bible Society, whose board he joined in 1815. He was also a member of the commission for revision of the New Testament and in 1817 also Member of the University of Copenhagen and learned schools. In 1828 he became the Royal Chaplain. Mynster is described by several church historians as a "power factor" already from the mid-1820s. In 1834 Mynster was made Bishop of Zealand Diocese, an office he retained until his death in 1854. As an elected member of the royal Stænderforsamlingen he met in Roskilde 1835, 1838, 1840, 1842, 1844 and 1848. Mynster was an active writer, who participated in many of the great debates, particularly with Grundtvig. Mynster was one of the principal objects of scorn in Søren Kierkegaard's book Attack Upon Christendom, published after Mynster's death. 1 2 3 Bricka, Carl Frederik (1887–1905). DANSK BIOGRAFISK LEXIKON (in Danish). XII. Bind. Münch – Peirup. Copenhagen: Gyldendalske Boghandels Forlag (F. Hegel & Søn). Retrieved 14 December 2009.